I have to start off by saying: I don’t like avocados. I’ve never really been a fan. Guacamole isn’t my thing and I couldn’t even fathom having it sliced on a sandwich or over a salad. Um, no thank you. Now, in an effort to create irony in my home, fate has made my husband and my daughter love avocados. 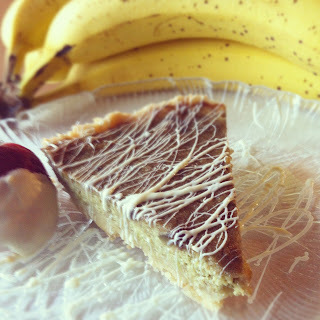 I always feel bad about not using it more in our diet for them, because it is pretty healthy, so this banana avocdo cheesecake recipe is dedicated to them. It’s also dedicated to all of you that not only like avocado, but are in love with bananas too. P.S.- this makes 2 regular pie sized cheesecakes or one deep dish cheesecake. Place the avocado, bananas and lemon juice in a stand mixer and mix together for about 3 minutes. You want the get most of the lumps out, but if both are ripe or over-ripe, that won’t be a problem. Place in the cream cheese and continue to beat until smooth. Add in the egg, sugar and salt. Beat until fully incorporated. Add in the vanilla and continue to mix for a few more seconds. Place in crust and cook for 25 to 30 minutes. Allow to cool for 3 to 4 hours, or overnight.